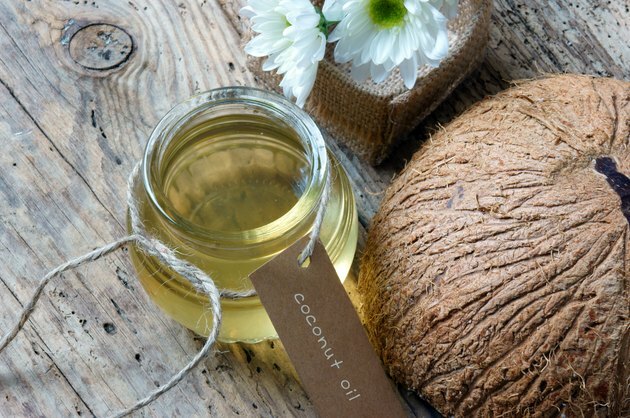 Is Coconut Oil Safe to Use While You're Pregnant? Pass on the pina coladas during pregnancy, but don't pass on the coconut. The fruit of the coconut palm offers numerous health benefits -- especially via its oil. Coconut oil is an affordable alternative to expensive skin creams and hair conditioners. It doubles as a tasty cooking oil that boosts immunity, regulates cholesterol levels and provides energy. Coconut oil also affords many benefits specific to pregnancy, but you're right to question how any product you put in or on your body will affect your unborn baby. Moderate amounts of coconut oil consumed during pregnancy may actually benefit your health, rather than compromise it. Coconut oil is almost 100 percent saturated fat, a type of fat vilified by the American Heart Association and other health organizations. But not all saturated fats have negative effects on the body. Lauric acid, the primary fat in coconut oil, is actually a medium-chain fatty acid that has positive effects on your levels of good cholesterol. Lauric acid has antimicrobial features that help to boost immunity, possibly for both you and your baby. Consuming healthy fats like coconut oil during pregnancy ensures you're able to absorb fat-soluble vitamins, which helps you get maximum nutrition. Pregnant women should consume 2 tablespoons of coconut oil daily to enhance immunity, recommends the Weston Price Foundation, a nonprofit organization dedicated to enhancing the nutritional quality of the American diet. Other possible benefits of consuming coconut oil during pregnancy include alleviating morning sickness symptoms, heartburn and constipation. An animal study, published in the August 2011 issue of the "International Journal of Developmental Neuroscience," found that supplementing stressed-out pregnant rats' diets with coconut oil resulted in babies that bounced back from low birth weight and compromised locomotor skills faster than those with mothers who didn't consume coconut oil. "Parents" magazine reports that the lauric acid in coconut oil may stimulate your milk production during pregnancy and after your child's birth. Coconut oil is an effective moisturizer that protects your skin, and your unborn baby, from exposure to chemicals in synthetic moisturizers. Use it to smooth out a tight belly and soothe itchy skin. Some people claim that coconut oil prevents stretch marks when rubbed on the belly. No scientific evidence supports this use, but it certainly won't hurt. Use coconut oil to tame flyaway hair, or rub a dime-sized amount into your hair after you shampoo to hydrate your strands as a natural alternative to chemical hair products. Whether you plan to apply coconut oil to your skin and hair or use it in cooking, opt for extra virgin options. These have not been chemically treated, explains Thomas Brenna, a professor of nutritional sciences at Cornell University, in "The New York Times." Refined coconut oil is often bleached and deodorized, which may make it harder on the liver, notes nutritionist Kimberly Snyder in the "Huffington Post." Choose organic if avoiding pesticides and GMOs is important to you during your pregnancy.